This semi wrap design has a custom overhang look with a razor jagged edge with drop shadow. 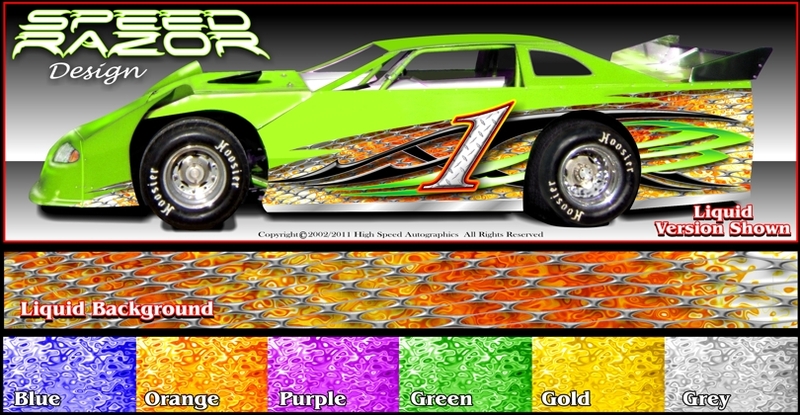 Choose 1 of 7 different background elements - Checkered Flag, Fire, Liquid, Lightning, Engine Turn, Mossy Camo, and Diamond Plate. The Basic Kit comes with side panel graphics, all your numbers and 2 driver's names @ 2" x 16". 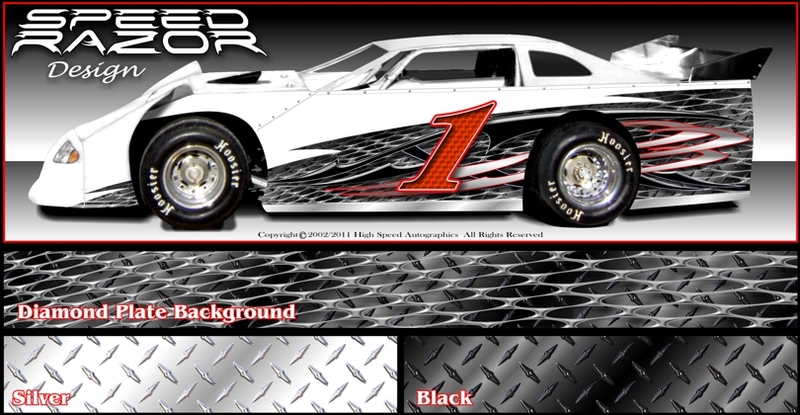 Add matching Hood Graphic ($150). Quality 3M Brand vinyl with 3M high gloss clear vinyl laminate makes this a well protected graphic kit. To purchase click on the Buy Now Button above and purchase from our secure shopping cart. 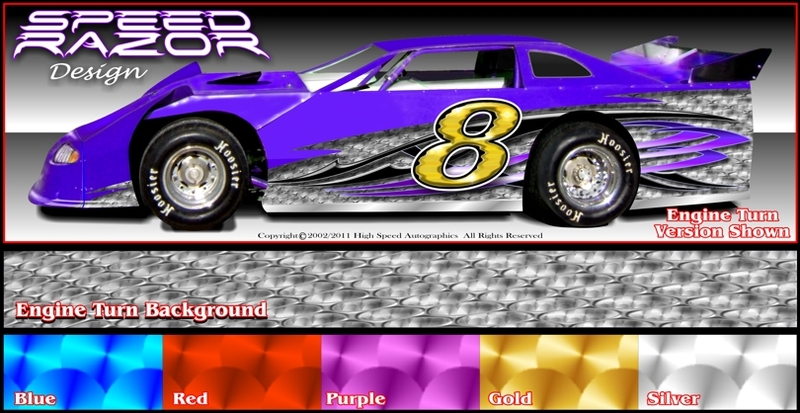 Then we'll need your dimensions from our race car template page. 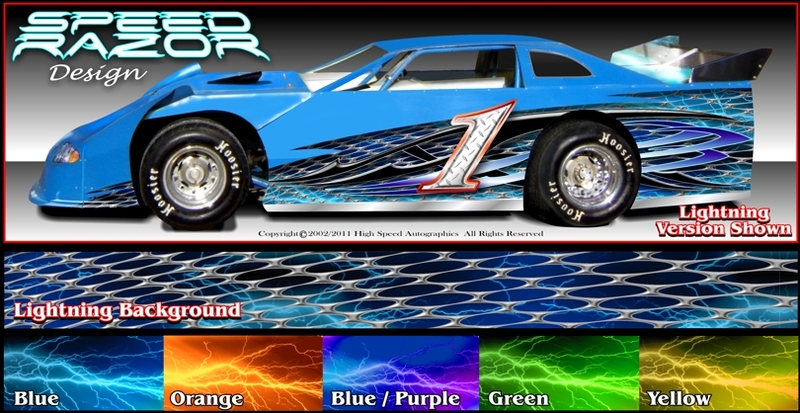 Select and use the Late Model template and enter your dimensions into iHotRod's Late Model Information Page. All numbers are included in the Speed Razor Kit. Use our digital printed numbers or overlay with speciality vinyl (Hologram, Mirror Lens, etc. extra $60 charge) for an added reflective look. Make sure your track rules allow reflective numbers before purchase. 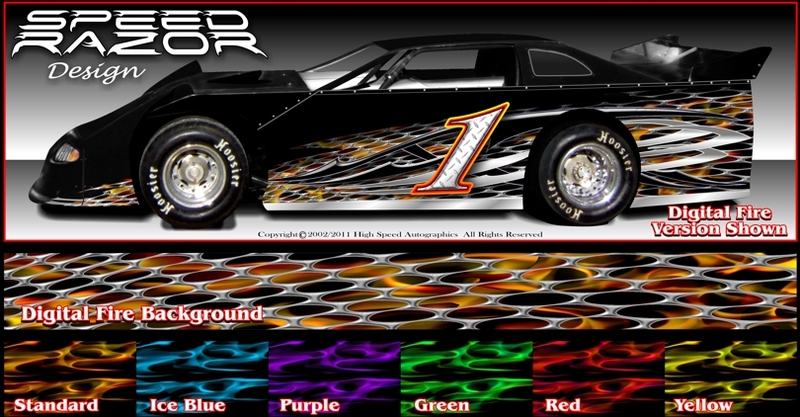 See our Numbers and Lettering Styles specific to Late Model Race Cars. Have a specific custom number that you use all the time? We can re-create that number at no charge! Send us the image and we can re-create the number(s) to be added to your graphic design. See the Numbers Styles that are included in our graphic kits.